Ikeja is one of the prominent districts in Lagos. It is the location of the state house and it is the capital of Lagos state. 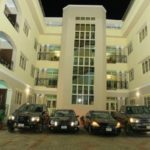 Also, this part of the state is known for important landmarks like the Murtala Muhammed Airport, the popular Computer Village, top class restaurants and several exquisite hotels. In this post, we take a look at the 5 best restaurants in Ikeja specifically in the government reserved area of the district. Located at 45 Isaac John Street, Ikeja G.R.A, the Place is one of the major restaurants in Ikeja. Some of delicacies served at this restaurant include a variety of rice dishes, asun, grilled chicken etc. 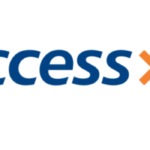 There are other branches of the Place in other parts of Lagos like Lekki and Victoria Island. The Place in Ikeja is close to popular hotels like the Lagos Airport hotel, Regent luxury suites, City View Hotel Ltd and the Apartment Royale hotel and suite. The hotel is usually opened from 10am to 12am from Monday to Thursday; and from 10am to 5am on Friday, Saturday and Sunday. The restaurant has a bar/lounge that is open every day by 5 pm except on weekends when it serves as a major nightclub where exclusive DJs and A-list musicians deliver and give live performances of great hits. Additionally, the Place offers delivery & catering services. Established in 1991, Jevinik has been providing top notch services for over 25 years. 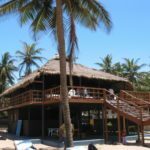 The restaurant is also known for its unique style of cooking which it deploying in preparing a wide range of meals that cut across cultures in Nigeria and Africa. Some of their local dishes include Efik dishes like Abak, Afang Edikang Ikong, Editang, Afia Efera and many more like the Ishiewu, Abacha, Nkwobi, Ugba, Ukwa, yam & Pepper soup. There are also delightful bespoke meals like the Mama’s delight, Fisherman soup, Uziza soup, Snail soup, White soup, Eforiro and Banga. Jevinik is located on 21 Isaac John Street, Ikeja, Lagos and the estimated cost of eating in Jevinik is ₦2000. The restaurant offers delivery services in addition to its eat-in service. The restaurant is open on Monday to Sunday from 9:00am to 10:00pm. 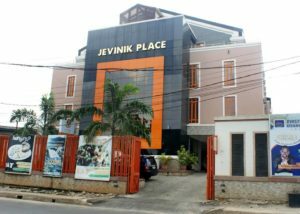 Jevinik is also home to a 1000 capacity event hall where you can host concerts, weddings, parties, government events, award ceremonies and more. There is also the Jevinik Chinese restaurant where you can enjoy cold dishes, soups, pork, sea food, fish, vegetables, rice and noodles, chicken, pastries or squid. 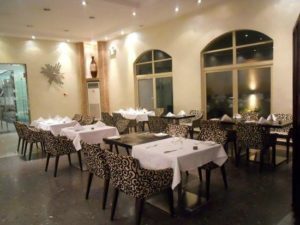 Located on 29 Isaac John Street, Ikeja, Lagos, Rodizzio restaurant is one of the top notch restaurants in Lagos. Rodizzio can be described as a colorfully painted one storey building with a restaurant downstairs and a lounge upstairs. 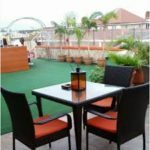 The restaurant features a terrace that comes equipped with a projector screen TV for a lovely viewing experience under the starry skies of Lagos. Rodizio is known for its buffet and a la carte meals. You can also enjoy a wide range of local delicacies, seafood, appetizing desserts and special BBQ meats. If you have ₦6000, you will be served a variety of food at Rodizzio restaurant. One of the interesting features of Rodizzio is the live entertainment. On Tuesday night, there is a Latina dance part while on Friday night, a top-rated DJ provides the audience with cool music. Also, on Saturday night, guest artists give live performances in the restaurant. The restaurant opens everyday from 8:00 am to 9:00 pm. 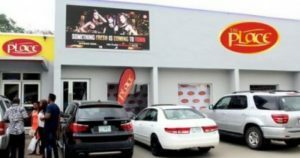 Yellow Chilli situated in the heart of Ikeja on 35 Joel Ogunaike Street, Ikeja. The restaurant offers delicious Nigerian meals like spicy stewed snails, pepper soup, jollof rice, seafood okra, prawn etc. 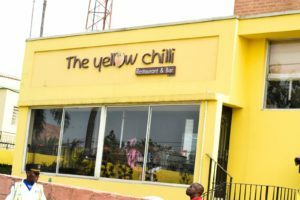 If you long to have a taste of well prepared African delicacies, Yellow Chilli is certainly one of the best restaurants to go to. The price of their main dish starts from ₦3,000 and the restaurant is open from 10 am to 10 pm from Monday to Sunday. The Regent Restaurant is located on 25, Joel Ogunaike Street, Ikeja, Lagos. The restaurant serves both intercontinental and local dishes. It is in close proximity to Glonik Hotels, Jerome’s Garden and Suites, Wazobia Plaza hotel etc. The estimated cost for a couple eating out in this restaurant is ₦10,000. The waiters deliver your order to you promptly and you get to savour your food hot and spicy. Regent is open every day from 6:00 am to 11:30 pm. Popularly called Browns, the Browns Café & Restaurant is located on 15B Sasegbon Street, Ikeja G.R.A, Browns Café and Restaurant is known for its long list of intercontinental and African cuisines. These include the likes of Efo riro and plantain, Afang soup, seafood okra, lamb chops, French toast etc. You can also find the best of coffee/hot chocolate and light snacks at this restaurant. The café has another branch in Victoria Island. Meals at Browns Café cost between ₦600 and ₦5000. The culinary team at Browns comprises experts that are known to use the highest quality, freshly sourced and organic ingredients. The restaurant also has another location in Victoria Island on16B Akin Olugbade Street. The interior of the restaurant is decorated and arranged in a Chinese fashion and it costs an estimated ₦5000 to eat at this restaurant. Jade/Zen garden is open every day from 11:00 am to 10:00 pm. Located on 52/54 Isaac John Street, G.R.A, Ikeja, Lagos.Golden Eagle Spur offers a variety of delicacies which include steak, seafood and burger. 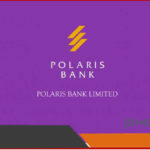 The restaurant has two branches, the first one is in Ikeja GRA while the second one is at Ikeja City Mall, Alausa.